Now that the deadlock is broken, I'm going to take the liberty of choosing a theme for the next round, if there are no objections. 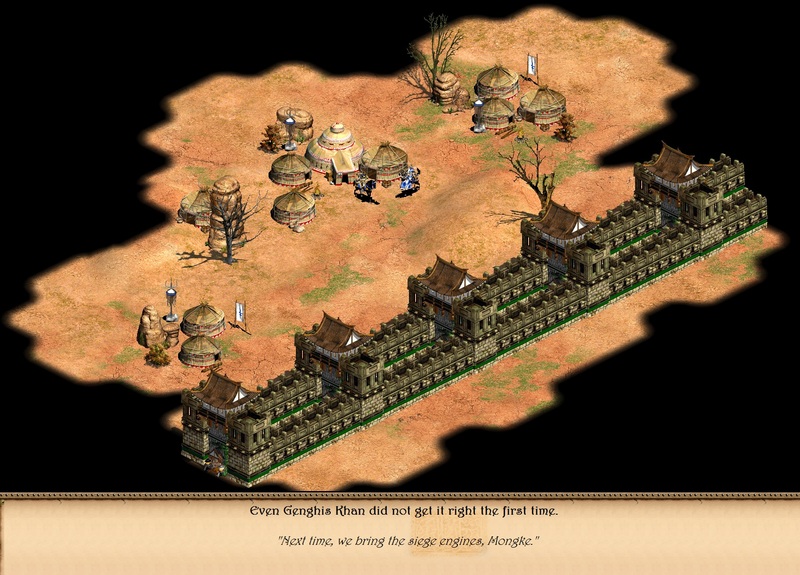 "With the city gates in ruins, the citizens of Zhongdu would discover exactly what a bunch of nomads from the Northern Steppes were capable of." The use of the barricades to simulate rubble is great too. I like it Mr Mew. Simple but effective. Voting open until April 28th. The screenshot makes excellent use of the mixing of the new African Kingdoms terrains interspersed with yurts, rock formations, elevation, bare trees, and bushes to present a realistic steppe landscape. The trick with the walls and towers on the Great Wall is a nice touch (though I personally prefer the method of removing wall pieces and creating towers in the empty spaces in the midst of the wall, but it is nevertheless well done). Extra points go as well for relevance to the theme and a nice humorous touch. Simple yet effective, this screenshot could nevertheless benefit from a bit more variety in terrain mixing and elevation. 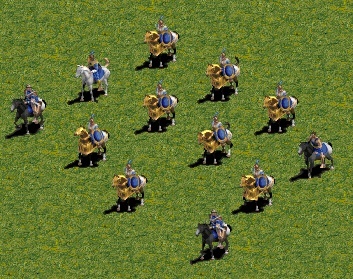 The AoK alpha lancers look a bit out of place next to the AoE2 units and objects, but do contribute nicely to a level of variety and relevance to the theme. The trick with the campfire is also quite nice. 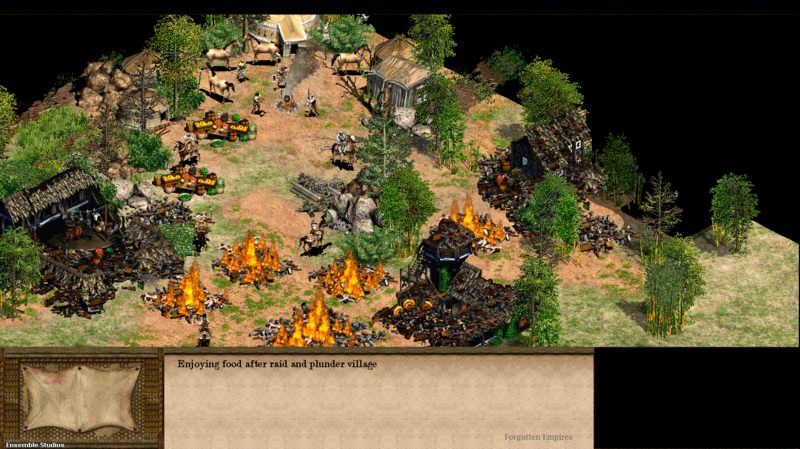 More than anything, this screenshot demonstrates remarkable skill in building placement, and the city design is bolstered by the use of acacias, bushes, and barricades to simulate rubble, although the use of the dirt paths in the middle of the road doesn't do the design any favors. Overall I had trouble choosing between this one and Al_Kharn the Great's, and eventually made my decision based on a tiebreaker of sorts derived from a combination of the minimalistic yet pleasing nature of Al_Kharn's screenshot combined with the humor value. I like them all but SaintCurious gets the nod. For the record, voting is already open (and thus it is too late to give entries), but just this time I'll allow this one. Nice work! I like it Aracks. Hmmm... I wonder what the lovely raiders are having for supper? it's like a little party. AoE I lancers Sam? I'm pretty sure they're from AoK alpha or beta. 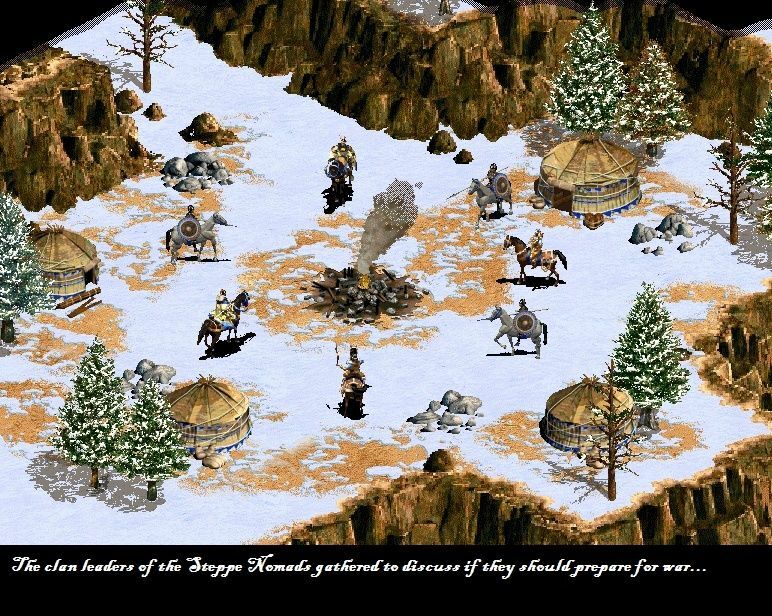 Definitely not AoE I.
I converted all aoe1 units to aoe2 and I'm pretty sure I didn't see the lancer in there. 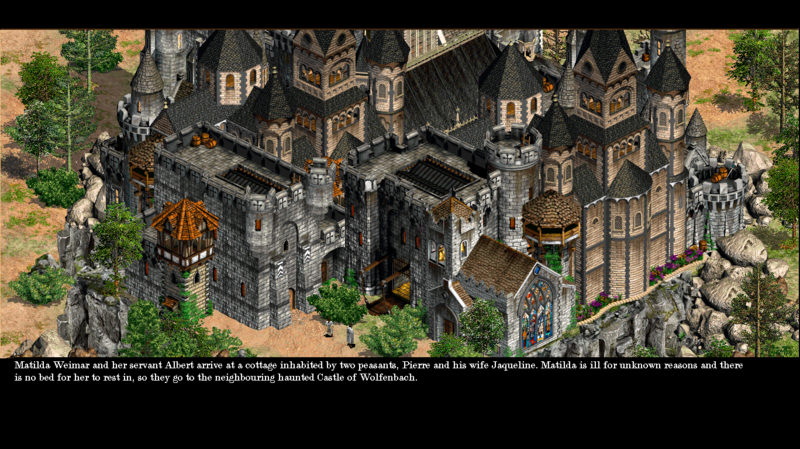 The style is also typical aoe2 beta. How is the conversion going Jan? Just like some can't wait for ToME, I can't wait for AoE I where I can rally units and use formations. I'm going to cast a tiebreaking vote and name SaintCurious the winner of this round. Feel free to choose the next theme! Awesome! Thanks to everyone who voted! Hmmm... How about we go with the theme Gothic Horror? There was no need for the tie breaker Saint Curious had three votes and I only had two, aha. Gothic Horror?. it is some goth ruins or vampire,another goth myth?. Accepting entries until May 18th! Seeing as SaintCurious has not designated either yes or no, the answer defaults to yes.